Nio says it has sold 3,350 ES8s -its first volume-manufactured vehicle – and plans to launch its second vehicle, the ES6, in June or July of 2019. Shares of Nio, widely referred to as the Tesla of China and backed by tech giant Tencent, jumped more than 4% ahead of Monday’s opening bell after the company’s deliveries topped for the third quarter its own target. The four-year-old electric-car startup announced Monday that it delivered 3,268 ES8s – its first volume-manufactured vehicle – in the third quarter, exceeding its own target of 2,900 to 3,000 vehicles by 9%. “While the planned production transition will slow our deliveries for October, it paves the way for accelerated production ramp in the future and we remain on track to achieve our delivery goal of 10,000 ES8s for the second half of 2018,”CFO Louis Hsieh said in the press release. The company added that it has sold 3,350 ES8s – a seven-seater high-performance electric SUV – since beginning delivery on June 28, and targets to launch its second vehicle, the five-seater ES6 premium SUV, in June or July of 2019. Nio went public on the New York Stock Exchange in September. In its IPO filing, Nio said it made $US6.95 million revenue in the first half of 2018, and that it had 6,201 unfilled ES8 reservations by the end of August, for which non-refundable deposits had been made but customers could still cancel their orders. Last week, a regulatory document revealed that Baillie Gifford & Co, Tesla’s largest investor after Elon Musk, owned 85.3 million NIO shares, or an 11% stake in the Chinese car maker. 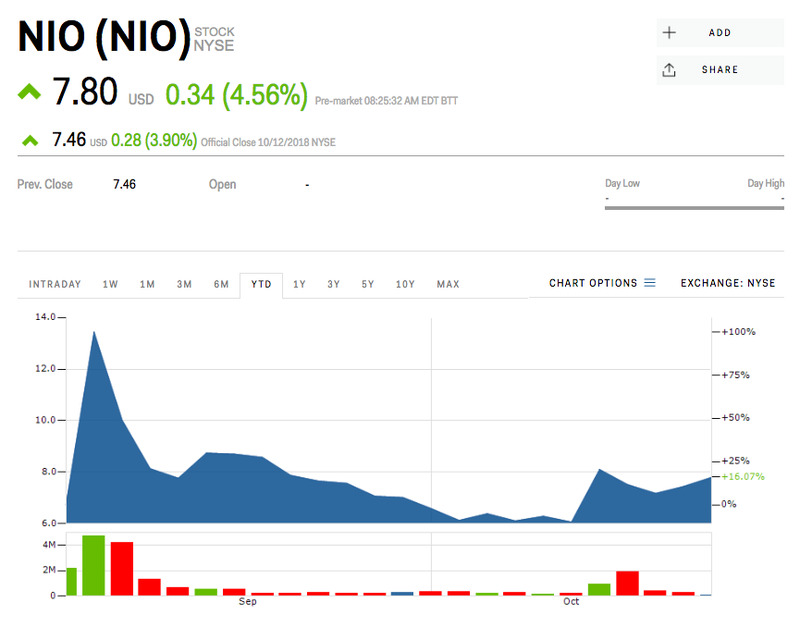 Nio is up 16% since going public.